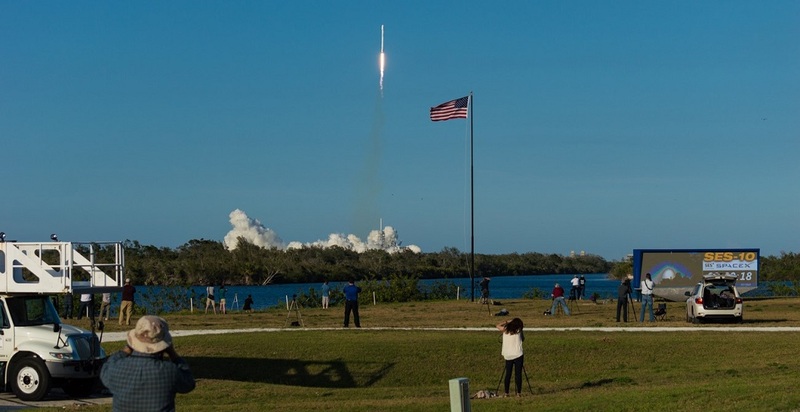 Up until now, Hawthorne, California-based Space Exploration Technologies (SpaceX) has only recovered first stages from missions it has sent aloft. That all changed at 6:27 p.m. EDT (22:27 GMT) March 30, 2017, when the company reused a first stage that had been used to fly a previous mission. In short, the company did something on Thursday that has not been done since the first rockets ventured into the black of space at the start of the Space Age. Before this history-making mission, rockets were single-use. Their multi-million dollar engines were left to plummet down into an ocean or the Kazakh Steppe below. SpaceX, since its inception in 2002, has been working to change this paradigm by having the first stage of its Falcon 9 rockets either return close to their launch site or out at sea on one of the NewSpace company’s Autonomous Spaceport Drone Ships (ASDS). The latter would be positioned out in either the Atlantic or Pacific Oceans. When the company originally released an animation in 2011 of what it was planning to do, it was met with derision from aerospace insiders. It is likely those insiders aren’t laughing anymore. With SpaceX able to provide launch services at a much lower cost than either International Launch Services or Arianespace, SpaceX has drawn many potential and current customers away from traditional launch service providers. While the company’s innovations might be partly responsible for this, the low price tag for launch, listed as being $62 million, is likely the chief determining factor. This alone has been enough to create shock waves among their competitors and, given that SpaceX has publicly stated that a reusable Falcon 9 could potentially cost around $5 million to $7 million range, the company’s impact cannot be overstated. Even before Thursday’s flight, SpaceX has managed to corner a large portion of the launch service market, including the lucrative payloads flown for the U.S. Department of Defense. According to a release issued by SpaceX, the company currently has more than 60 missions on its launch manifest representing over $7 billion under contract. the first landing of a rocket’s first stage on an ocean-based platform (the CRS-8 mission for NASA in April 2016). The March 30, 2017, SES-10 mission adds yet another entry in SpaceX’s list of firsts. In fact, another “first” was possibly revealed by SpaceX board member Steve Jurvetson when he said that SpaceX plans to attempt a fairing recovery during the SES-10 launch. If that is successful, it would mean that the only part of the Falcon 9 booster that wasn’t recovered from the launch of SES-10 would be the second stage (Elon Musk later announced at a post-launch news conference that the payload fairing had landed). Thursday’s launch got started at 6:27 p.m. EDT (22:27 GMT) when the nine Merlin 1D rocket engines, arranged in an Octaweb formation at the base of the Falcon 9’s first stage, roared to life, lifting the slender cylinder of the rocket and its SES-10 satellite payload off the historic Launch Complex 39A and on its way into the sky. At about one minute and 13 seconds into the flight, the Falcon 9 hit Mach 1, with the amount of thrust the rocket was unleashing estimated by SpaceFlight Now at being around 1.7 million pounds (7,500 kilonewtons) of thrust. Some eight seconds later, the rocket had reached an area of maximum dynamic pressure, known as max-Q. Here, the rocket’s speed conspired with the pressure of the air to place the vehicle under the greatest amount of stress during the flight. Some 2 minutes, 38 seconds after the Falcon 9 had left 39A, main engine cutoff (MECO) occurred and the first and second stages separated about three seconds later, leaving the former to conduct its second landing on the Of Course I Still Love You ASDS positioned out in the Atlantic. After stage separation, the second stage ignited its lone Merlin 1D engine at a mission elapsed time of 2 minutes, 49 seconds and continued to burn for approximately six minutes. One minute after the second stage’s engine had ignited, the payload was free of enough of Earth’s atmosphere that the payload fairing (which acted as SES-10’s shield during ascent). The roughly 17-foot (5-meter) diameter payload fairing was then jettisoned and left to fall back to Earth. The payload fairing itself is an impressive structure, comprised of carbon fiber and aluminum it stands some 43 feet (13 meters) in height. Meanwhile, some six minutes after it had left Kennedy Space Center, the Falcon 9’s first stage initiated its entry burn, beginning the journey home. 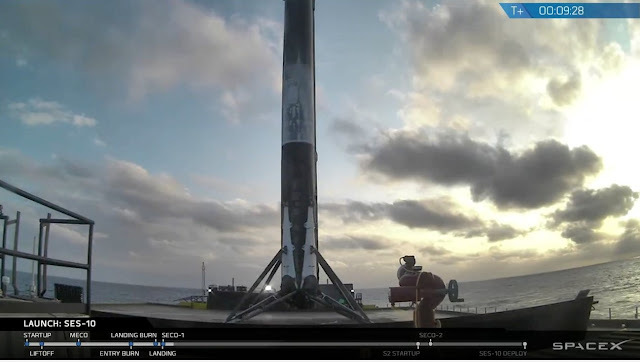 Then, about eight-and-a-half minutes since it had launched, completed staging and reoriented itself, the Falcon 9’s first stage touched down safely on the ASDS. After sending SES-10 toward space, the pre-flown first stage of the Falcon 9 made its second landing on SpaceX’s drone ship. Photo Credit: SpaceX webcast. This particular first stage was first used to launch the CRS-8 Dragon spacecraft to the International Space Station on April 8, 2016. Just like on Thursday, upon successfully delivering the cargo freighter to orbit under the $1.6 billion agreement that SpaceX has with the space agency, it touched down on the ASDS and was readied for its next flight. High above, the second stage’s engine cut off, as planned, 8 minutes, 34 seconds into the flight. At this point in the mission, the stage and SES-10 payload were in a parking orbit where it coasted for about 18 minutes. Twenty-six minutes, 29 seconds after leaving the launch site, the second stage restarted its engine for a burn lasting about one minute to place the spacecraft into a geostationary transfer orbit with a low point of 135 miles (218 kilometers) and a high point of 22,000 miles (35,400 kilometers) with an inclination of 26.2 degrees from the equator. Spacecraft separation took place at about 32 minutes, 3 seconds after leaving Florida. Over the next couple weeks, the spacecraft will use onboard thrusters to circularize its trajectory into a geostationary orbit some 22,000 miles (35,000 kilometers) above Earth. Its final orbital location will be at the 67 degrees West longitude. Boy did that 1st stage come in hot. You could see the grid fins glowing/burning after the reentry burn. But it landed just fine.